My last blog was all about Austin, specifically SXSW and the Southwest Invasion event that I am part of each year via the Quantum Collective. Don’t worry, I am not going to quiz you on what I wrote then, but did want to give a little extra attention to a fantastic company that was one of our primary sponsors, Fiverr [https://www.fiverr.com]. For those not familiar, Fiverr is the marketplace for creative and professional services, where every item starts at $5.00 – and with 50 percent of the workforce expected to be freelance by 2020, Fiverr is a company to keep your eye on.  Fiverr is a haven for freelancers who are able to offer services to a global marketplace. As for purchasers, they have the potential to work with a lot of creative and talented people for a price that fits their budget. When Fiverr came on board as one of our sponsors for the Southwest Invasion, we were excited, but working with them really showed us what they were about: creative, smart, innovative people who tackle each project like it’s literally the most important one in the world! 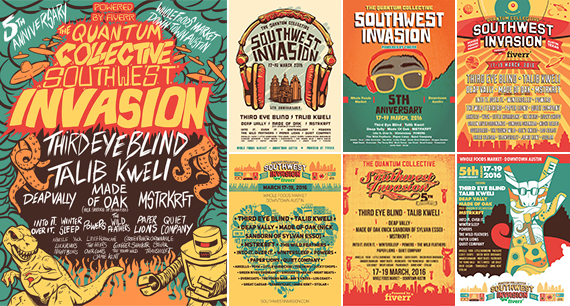 The first thing we did together was to launch a contest to “Design a 5th Anniversary Southwest Invasion poster.” Fiverr put the call to action out on their website to their top designers and WOW – the entries! fiverr member richicrypt’s (Richard Crypt) design was selected to be the exclusive poster for this year’s concert series, with the artwork silkscreened onto collector-quality posters. The poster was sold at the event, with proceeds going to the Whole Planet Foundation (more on that later). As you can see from our photo, it was really hard to choose the winner! We worked very closely with Fiverr marketing Director Adam Swart, who also sat on my panel at SXSW (read more HERE). One of the things he pointed out to the panel-goers was that people who are building their brand or their music career can use Fiverr as their ‘day job’ – be it designing a business card for someone, helping produce a song, or teaching a student to read music – these are all services that are for sale on Fiverr. It is really encouraging for artists to have this platform to work from rather than a 9-5 job they’re not passionate about. Fiverr was also part of our Lifestyle Village on the Whole Foods Austin rooftop, where they had their own Lounge for people to chat, catch up on emails, or just relax. The Lounge was decorated with caricatures of all Southwest Invasion performers sourced via Fiverr’s talent pool. Additionally, the artwork, like the aforementioned poster, was sold at the Lounge, with all profits going to the Whole Planet Foundation’s Musicians for Microcredit charity. The Quantum Collective is a partner with the Whole Planet Foundation’s Musicians for Microcredit™ program, which engages musicians to use their platform to alleviate global poverty. Not unlike the Southwest Invasion, whose principle is built around a philosophy of discovery for both music and brands, Fiverr does that all day, every day. Their platform enables people to DISCOVER cool stuff, while people who CREATE cool stuff provide it. It was exciting to work with a tech company that powers an entire ecosystem of creativity. The Southwest Invasion was the first live music event for Fiverr, and we’re looking forward to working with them again next year. They have an amazing marketing team that truly embodies the spirit we see so much of at SWI. The enthusiasm, zest and excitement they brought to our event still have us talking about it 2 months later!